BOSTON, Mass. and WASHINGTON, D.C. – In its biggest year to date, the United States solar market nearly doubled its annual record, topping out at 14,626 megawatts (MW) of solar photovoltaic (PV) installed in 2016. This represents a 95 percent increase over 2015’s then record-breaking 7,493 MW. 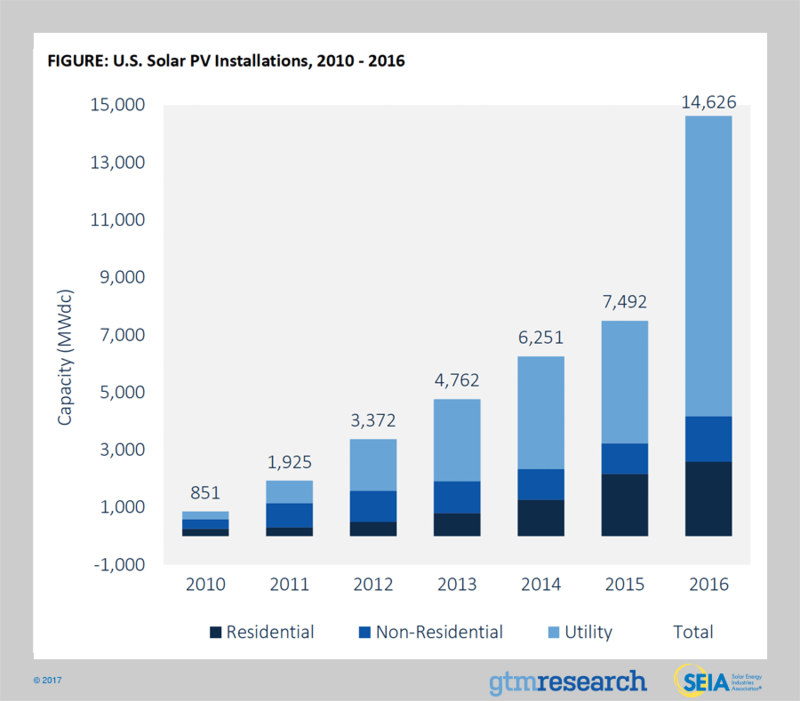 GTM Research and the Solar Energy Industries Association (SEIA) previewed this data in advance of their upcoming U.S. Solar Market Insight report, set to be released on March 9. For the first time ever, U.S. solar ranked as the number one source of new electric generating capacity additions on an annual basis. Altogether, solar accounted for 39 percent of new capacity additions across all fuel types in 2016. Success this year was driven largely by the utility-scale segment, which was bolstered by a pipeline of projects initially hedging against the extension of the federal Investment Tax Credit. Not only did it represent the most MW installed, but the utility-scale segment also featured the highest growth rate of any segment, growing 145 percent from 2015. The non-residential market also exceeded expectations with two major growth drivers in the segment. The first is community solar, adding a record total of more than 200 MW, led by Minnesota and Massachusetts. Second, rate design and net energy metering fueled a rush in project development and installation growth across a number of major state markets, most notably in California. For the first time since 2011, non-residential installation growth surpassed residential solar growth, which posted a still-impressive 2,583 MW. While growth in California’s residential market has begun to level out, strong growth in markets like Maryland, New Jersey and a handful of emerging states where solar has achieved grid parity, helped the residential segment to grow 19 percent year-over-year. As a result of a remarkable 2016, the U.S. is now home to more than 1.3 million solar PV installations with a cumulative capacity of over 40 gigawatts. On March 9, GTM Research and SEIA will release the complete U.S. Solar Market Insight 2016 Year in Review, the industry’s definitive source of state and segment-level solar data, analysis and forecasts.